Bridesmaids... are you a help or a hindrance? 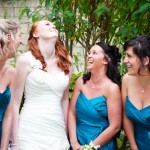 Bridesmaids…are you a help or a hindrance? Bridesmaids are a huge part of any wedding celebration. A bride usually chooses her bridesmaids as an acknowledgement of a close relationship – a best friend, a sister, future sister-in-law. She wants those people to be actively and closely involved in the preparations for the wedding. A bridesmaid is likely to be there when a bride chooses THE dress, helps to arrange the hen party, trawls round endless wedding shows looking for inspiration and the right suppliers and calms those frayed nerves as the day looms. On the day itself a bridesmaid will be there to calm down a frazzled bride, help her into her fabulous dress, straighten that dress before the walk down the aisle and look pretty in a dress chosen by the bride especially for the day. A bridesmaid may help to gather groups together for photographs and generally be around to help in any way they can to make the bride’s day truly fabulous. The clue is in the title-Bride’s Maid. A bridesmaid is there to support you, for toilet duties, hold your bouquet and generally look glam and, shock horror, happy. Some bridesmaids perform their duties with enthusiasm, going above and beyond what is expected of them, enhancing the whole wedding experience for the entire wedding party. As a leading wedding blogger at Love Me Love My Wedding, we have met some absolutely fabulous bridesmaids who still have a soft spot saved just for them in our hearts. 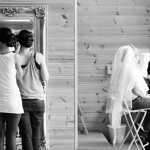 However, and here is the sticky issue, some bridesmaids not only fail to perform the most basic requirements. But actively cause problems – moaning when asked to pose for one photograph, disappearing at critical times, caught up in their own selfish needs leaving a bride floundering to deal with important aspects of the day alone causing many a bride anxiety and stress on their wedding day. 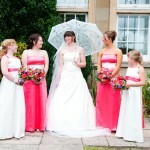 It is shockingly common for a bride to confide of their regret at their choice of bridesmaid on their wedding day. Really? Come on future bridesmaids – you are the bride’s most trusted ally – don’t be worrying about your fake tan lines while the bride is panicking about how to do her makeup! Don’t disappear for a dose of nicotine when it’s time to get the bride fastened into that corset! Don’t leave getting dressed so late that the bride is ready half an hour before you and the wedding car arrives before you are ready. Don’t moan about having your photograph taken – a bride has usually specified what images she wants to be captured because she wants you to star alongside her on her special day. Be fabulous! Be supportive! Most of all be a wonderful friend!